There are three things that can never be defeated – even by a destruction caused by a nuclear bomb. Those three things are the human spirit, hope, and music. During the WWII, the Nazi targeted anyone who did not fit into their ideology. It might’ve seemed easy to take one life after another on the path to reaching their evil goal. Yet, when it came to music, they had to learn to modify it, to reduce its power, and slowly, make it insignificant. However, there were musicians like Django, who proved that it was impossible to manipulate their music and the rhythm they played. For a simple reason – it was simply uncontrollable. Set in 1943, the film takes us to occupied Paris, where a group of gypsies is killed in the woods by the Nazi. In the meantime, the excited audience at the concert hall is waiting for Django Reinhardt – the famous composer and guitarist – to finally grace the stage and to bring ‘Heaven on Earth’ to them through his music. 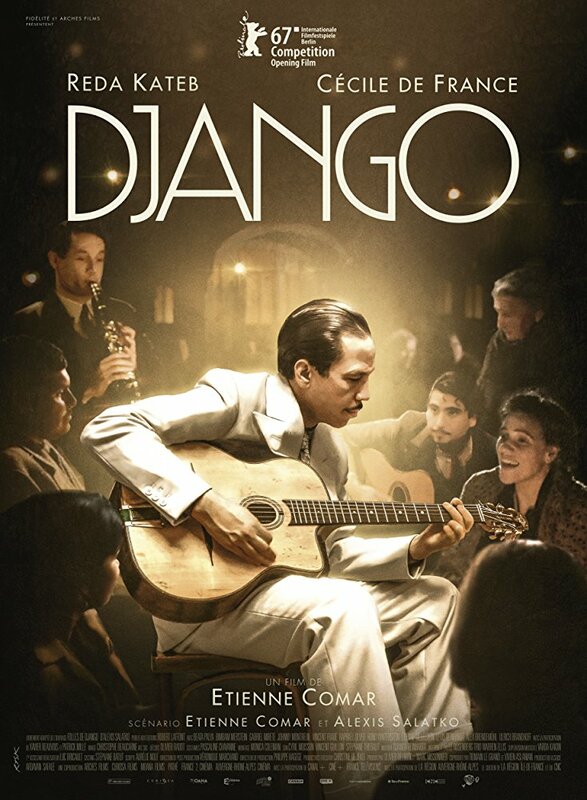 After the concert, Django is approached by the representatives of German Propaganda Office, who offer him to give the biggest concert of his life. It will take place in Germany; and perhaps, Grimley and Hitler will attend it. As the film follows Django and his possible trip to Germany, he has enough time to analyze on what side of history he wants to be and we get to know his strongest reasons to oppose the regime forced by the Nazi. There is a scene where the Nazi propaganda office requests Django to go to a doctor for a check-up. As it is revealed there, the famous musician has only two fingers, as he was injured trying to escape a fire when he was little. Despite the fact of being unable to use all five fingers on his right hand, he finds his way to master the skills of playing the guitar and becoming one of the most influential figures of the 20th century. Perhaps, the biggest personality France ever could ever boast to have. The most inspiring part of “Django” is realizing how effortlessly music can take us away from deadly war and provide shelter to those, who allow it to feed their minds and hearts. Etienne Comar’s film offers the most beautiful score to the viewer. You will be absorbed by it and carried away by the performance of the lead actor – Reda Kateb, who portrays Django. The film has its ups and downs. At times, it feels like the creators struggle to keep the story straight and the drama to continue. Yet, that does not happen too often and does not give any reason to worry. There is always something that will distract you from what you have disliked about it. The story is decent; the music – outstanding; the performance delivered by the cast is solid and combined with the directorial approach which clearly emphasizes that war cannot be handled or accepted in any way. Yet, it can be modified, adjusted to the level when it loses its insignificance in the same way when the Nazi wanted to destroy the music. And you already know who won in that war, and it is the art that can be interpreted and expressed in so many ways.